The SFFA is an evidence-based assessment measuring functional fitness for residents living in retirement. The assessment consists of a short list of tasks used to measure balance, mobility, endurance and other components of health. Functional fitness is required to perform tasks in day-to-day life (for example, getting dressed, running errands). Those with high levels of functional fitness will likely remain independent for longer. Maintaining independence is very important to older adults, especially those living in retirement homes. The SFFA is designed based on current best practices. The tool includes measurements for balance, mobility, endurance, walking speed, flexibility, strength, posture, and general health information. This assessment is typically completed for new residents and is redone multiple times if the resident wishes by a kinesiologist. 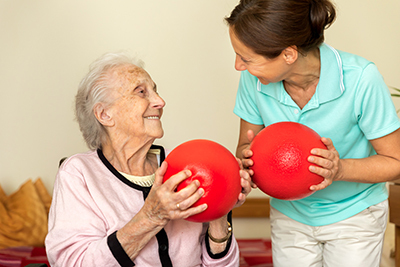 The results of the assessment can show the residents’ current level of functional fitness, help the kinesiologist make recommendations for physical activity, lifestyle, and walking aids, and provide data to track changes over time. This is important because the kinesiologist can use this tool to help residents improve their level of functional fitness, remain independent and improve overall quality of life.